Hey! Hey! Hey! 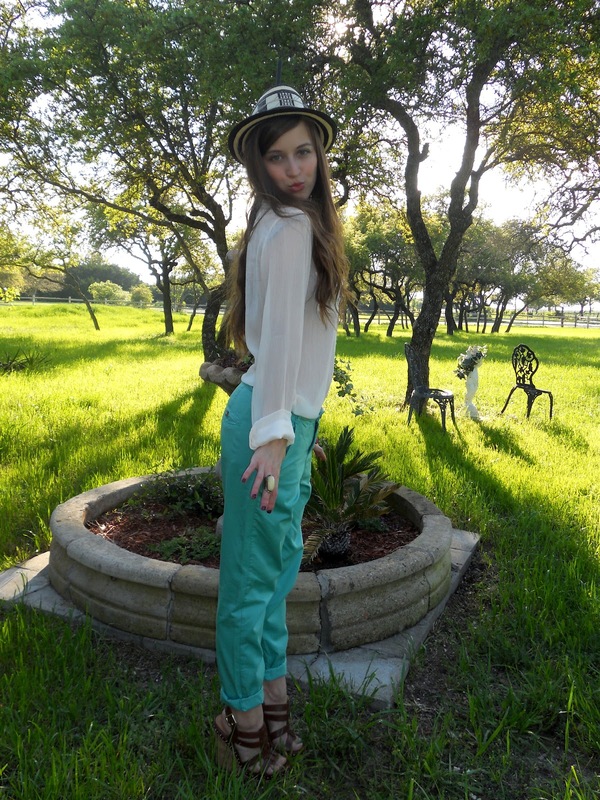 I finally found a pair of mint pants! I've been searching forever. I'm obsessed with the color. I'm still on the lookout for some skinnies, but these chinos are super fun! I'm so excited for tonight! I finally get to see The Hunger Games in IMAX! Cannot wait! I hope some of my excitement rubs off on y'all! Those pants are great! I have been obsessed with chinos lately! Love!!! I have been looking for some mint pants! These are too cute and I love your hat!!! Love your outfit, so preppy chic! I like the mint green color, so calming! Love this look so much! Bright trousers are amazing! I am following you! Follow me back if you also like my blog! I've been on the hunt for some mint jeans as well...love these. Cute post, beautiful blog! Thanks for your comment! Loving the color of those pants, great look! Take a look to my blog...We could follow each other? I really like your blouse! Do you know how hard it is to find a decent white blouse? I am so picky about things like that but yours is perfect! And I just realized that I wasn't 'officially' following you on GFC. I am now! Thank you! Love your look as well! Do you want to follow each other? Just stumbled onto your blog nd it is so cute!! I love this outfit too, so casual cool. Love the layered bracelets. oh gosh, you look absolutely gorgeous girl! 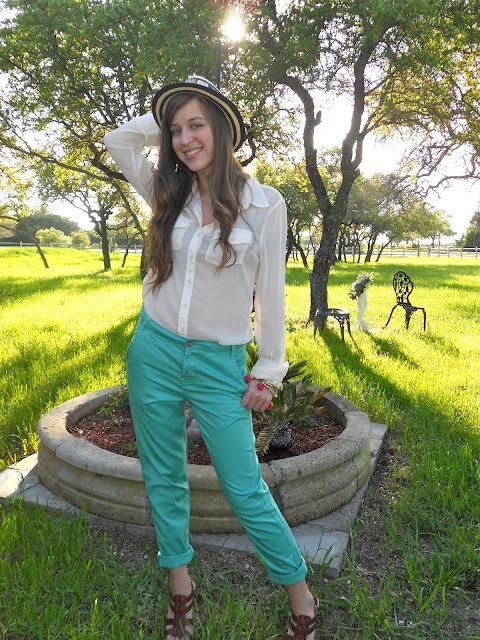 love those mint pants. i'm on the lookout too!! Love these outfis, I'm dreaming with mint pants. Thanks for commenting my blog. Following you! Follow me if you want. Love the chic and casual style! But my weakness are the multi bracelets! I love your look, those pants are awesome. what a beautiful, beautiful outfit my dear! you look lovely! Love the color of these pants! thank you so much! I followed back!